This summer, Carlos Callejo, a long time Los Angeles muralist and artist, partnered with Echo Park’s Central City Action Committee and local middle and high school students to design and paint murals on 10 utility boxes located in Echo Park and Chinatown. Carlos and CCAC identified a total of 10 utility boxes spread between Council District 13 and Council District 1. CD 13 provided CCAC with a small grant to help fund a stipend to the local youth that would be involved in the project. CCAC had a total of seven youth participate on this project, three of which are from CD 13. Five of the newly completed murals are in Echo Park. Not only are the murals beautiful, they help prevent graffiti by denying taggers a blank surface to work on. The project, completed in early October, also provided summer jobs for the area’s youths. For more information, please contact Alejandra Marroquin at Alejandra.Marroquin@lacity.org or 323-957-4500. 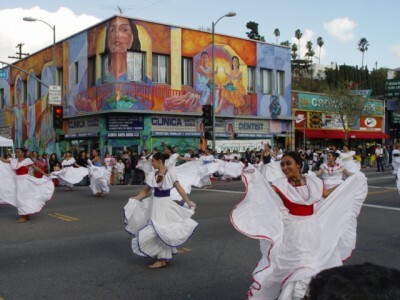 On Saturday December 11th, Echo Park will celebrate its annual Community Parade along Sunset Boulevard. The parade will stretch from Glendale Boulevard to Elysian Park Avenue and will last from Noon to 3:00 PM. Reverend David K. Farley of the Echo Park United Methodist Church will serve as this year's Grand Marshal. Parade Ambassadors are include Peter L. Lassen, Walter & Sumiko Elmer, Dr. Fredy Perez and Sallie W. Neubauer. For the more parade information please visit echoparkcommunityparade.com. Tough economic times, which left the city with a $405 million deficit this year, forced across the board cuts including to our libraries. When the budget was passed, I said that would work to make sure libraries are a top priority when the budget picture was brighter. The outlook, however, remains dim so we on the Council, led by Councilmembers Parks and LaBonge, looked for a solution that would address our library crisis while taking into account our economic and budget situation. On Wednesday, the Council passed a motion that would guarantee funding for libraries to remain open for six days a-week in good times or bad, without any additional cost to taxpayers. The measure requires the city to allocate a certain percentage of the budget every year to our libraries. This requires a change to the City Charter, which only can be changed by the voters. Los Angeles will have a chance to vote on this amendment on March 8, 2011, and I will help ensure they do. Libraries are a proven and cost-effective way to improve our economy and keep our youth on the right track, and this measure supports libraries with no increased cost to the taxpayers. When we prioritize libraries we are at the same time prioritizing safe places for kids to learn after school and increased access to printed and online information that can make the difference in our workforce's competitiveness. In 2009, over 4,000 Angelenos came together for the largest homeless count in the nation. Over 50,000 homeless men, women and children were identified, providing data that is critical to addressing the complexities of homelessness and planning how to best invest public resources, raise public awareness, identify the needs of homeless people, and improve service delivery opportunities to prevent and eliminate homelessness in Southern California. Volunteers are teamed up, trained, given all needed supplies, and deployed to designated areas within the County to enumerate the homeless in one night. Volunteers will be expected to devote approximately three hours of their time. For more information, please visit the Los Angeles Homeless Services Authority’s website at LAHSA.org or e-mail volunteer@lahsa.org. To register, go to TheyCountWillYou.com. UPDATE: Due to impending rain, the flea market has been postponed to Saturday, December 18th. Tomorrow, Saturday November 20th, the flea market in the Dodger Stadium parking lot will be held from 9:00 am to 3:00 pm. In order to protect the surrounding neighborhoods only the Downtown Gate (adjacent to the 110 south exit/Stadium Way) and the Sunset Gate (Stadium Way /Elysian Park Avenue) will be open for attendees and vendors. For more information, visit PDMarkets.com or call Noel Pallais at 323.224.2636. 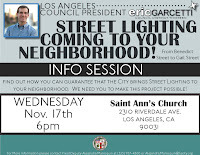 On Wednesday, November 17th at 6:00 pm, we will be hosting a free information session on street lighting at Saint Ann's Church at 2310 Riverdale Avenue. 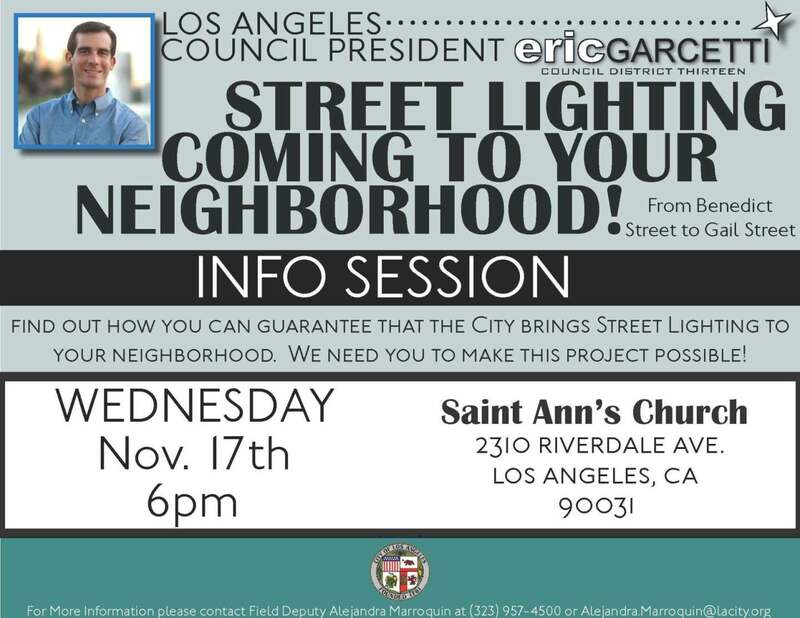 We will be discussing street lighting improvements in Elysian Valley from Benedict Street to Gail Street. For more information, please contact Alejandra Marroquin at 323-957-4500 or Alejandra.Marroquin@lacity.org. 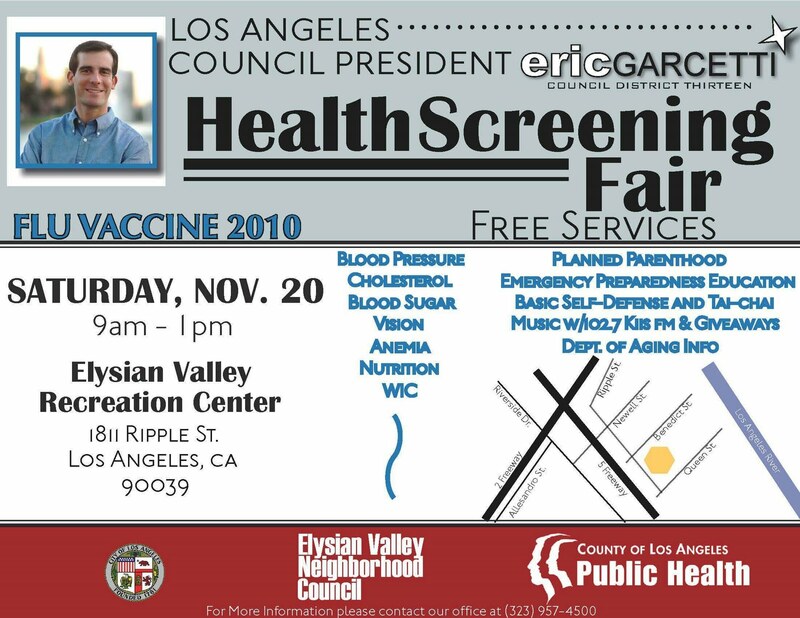 On Saturday, November 20th the Elysian Valley Neighborhood Council and the Los Angeles County Department of Public Health will be hosting a free health screening fair at the Elysian Valley Recreation Center, located at 1811 Ripple Street, from 9:00am to 1:00pm. 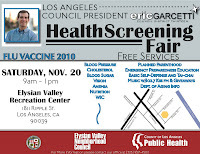 Free flu vaccines will be provided as well as blood pressure, cholesterol, blood sugar, vision, and anemia testing. There will also be information provided about emergency preparedness, family planning, and basic self-defense along with music and giveaways provided by 102.7 KIIS FM.. For more information, please call our district office at 323-957-4500. In October, President Obama signed into law Congresswoman Diane Watson’s bill to officially change the name of the Crenshaw Post Office to the Tom Bradley Post Office. 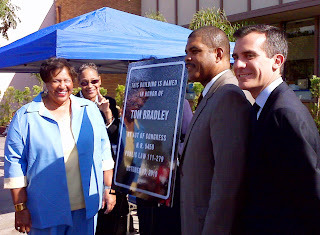 Last Saturday, I joined Congresswoman Watson, members of the Bradley family, and Councilmembers Wesson and Parks for the official dedication ceremony. Thomas J. "Tom" Bradley was born December 19, 1917, in Texas, the son of a sharecropper and the grandson of former slaves. In 1924, the family moved to Los Angeles. As a promising athlete he was recruited by Polytechnic High School in Los Angeles where he starred in football and track. He attended University of California, Los Angeles on a track scholarship, but dropped out of UCLA during his junior year to attend the Los Angeles Police Academy. He became a member of the Los Angeles Police Department in 1940 and studied at night at Southwestern University School of Law and received his law degree. He served on the Los Angeles City Council from 1963 to 1972. Bradley went on to serve as a five-term mayor of Los Angeles from 1973 to 1993. He was the first and to date only African-American mayor of Los Angeles. His 20 years in office marks the longest tenure by any mayor in the city's history. He presided over a period of enormous growth in Los Angeles and positioned the emerging metropolis to take its place as a hub for international trade. He brought the city a spot on the world's center stage with its hosting of the Olympic Games in the summer of 1984. His legacy includes the gleaming downtown skyline of Bunker Hill, the start of a subway and light rail system, and numerous city institutions that bear his name, such as the Tom Bradley International Terminal at Los Angeles International Airport. Bradley married Ethel Arnold in 1941 and the two remained married for the remainder of his life. The couple has two surviving daughters, Phyllis and Lorraine. Tom Bradley passed away on September 29, 1998, and Ethel on November 25, 2008. The Community Redevelopment Agency of the City of Los Angeles is right now studying an area that overlaps with the neighborhoods of Atwater Village, Cypress Park, Glassell Park and Elysian Valley to determine community and economic needs. An open house will be held tomorrow, November 10 at 6 pm to hear from neighborhood residents at Dickerson Employee Benefits, 1918 Riverside Drive, Los Angeles, CA 90039. I urge you to attend and speak out about your neighborhood. For more information, visit www.crala.org/nela. iWATCH is a new community awareness program created to educate the public about behaviors and activities that may have a connection to terrorism. iWatch also allows the public to report anonymously suspicious behaviors and activities. Anyone can report suspicious activity, completely anonymously, by going to iWATCHLA.org or by calling 1-877-A-THREAT. Go here, for more information on the program or here for a list of suspicious activities. Remember, the iWATCH program is about behaviors and activities, not individuals. One of the best ways to help support Los Angeles and our local economy is by shopping local. Shopping in Los Angeles not only helps local businesses, but supports vital city services and creates jobs. LA’s strength is in its dozens of individual neighborhoods, communities and shopping districts. Shopping in LA helps keep them alive and growing by helping to link neighbors and better enable local businesses to support local causes and improvement projects. Visit ShopLACity.com to find out more about the best shopping centers near you. Take the Historic Echo Park Home Tour Nov. 14; Better Yet, Volunteer! 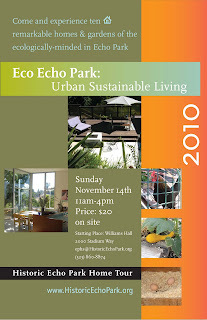 This year's Historic Echo Park Home Tour, which runs from 11 to 4 on Sunday, November 14, highlights eco-friendly homes and gardens that use greywater systems, solar power, natural light, improved air flow, and drought-tolerant landscaping to reduce their energy and water use and benefit our overall air quality and environment. Urban farming and no dig gardening will also be highlighted during the tour. Advance tickets are $15 and are available at www.HistoricEchoPark.org through Nov. 13. Day-of tickets are $20 and are available at Williams Hall at Barlow Hospital, 2000 Stadium Way. You can take the tour for free if you volunteer as a docent, who are also invited to the tour after-party starting at 5 pm. Docents can choose to volunteer from 10:45am-12:45pm, 12:30pm-2:30pm, or 2:15pm-4:15pm. For more information, contact Dave Ptach at edendaleprojects@yahoo.com.